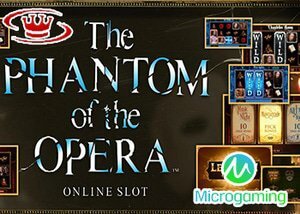 Microgaming has released the amazing new Phantom of the Opera slot game and players can benefit from a Microgaming no deposit bonus when they are ready to enjoy the thrills of this themed game. Based on the hit musical from Andrew Lloyd Webber, the Phantom of the Opera slot will provide the chance to enjoy massive payouts and the action starts by claiming a no deposit bonus with no risk at all. The new Phantom of the Opera slot can be played with many of the top Microgaming no deposit bonuses online and players will find some great offers to enjoy. These no deposit bonuses will provide free cash to start playing this amazing five reel video slot that features 243 ways to win. With Phantom of the Opera, players will enjoy a thrilling experience and will hear original music from the soundtrack. They will also benefit from an amazing visual presentation as well as multiple bonus features. The game can be previewed for free or can immediately start generating real money payouts when any no deposit bonus is used. Those that have existing Microgaming casino accounts can start to wager anywhere from $0.30 to $15 per spin and bet amounts can be altered at any time so that players can always place wagers that suit their budgets. With this great game and the Microgaming no deposit bonus offered, players will enjoy multiple features that can boost overall payouts. There is a wild that will replace all symbols except for the Phantom Mask and the Letter. The wild can be a stacked symbol, so it can help to complete many winning combinations. In regards to bonus features, there are two that are in the base game. The first is the Letter Bonus that will be triggered when Letter symbols appear on the fifth reel. This will offer n instant win that can be as high as 20x the bet amount. The Chandelier Bonus is a random bonus and this will cause the chandelier to drop onto the reels and cause two or three reels to become wild. There is also three bonus features that are triggered by three or more Phantom Mask icons anywhere on the reels. These include The Music of the Night Free Spins, offering 10 spins and 5 random wilds, 3 wild reels 2-5 extra free spins or multipliers between 2x and 4x. The Masquerade Pick Bonus is a 3 level mini game and players will choose masks to reveal instant wins. Finally, there is the All I Ask of You Free Spins, offering 10 spins with Dancing Wilds. Many of the leading online casinos with offer a Microgaming no deposit bonus for players to get started and this is a great way to preview The Phantom of the Opera slot game that has just been released. One of the great deals presented online will offer a $5 No Deposit Bonus from Casino 440 so players can immediately get started with this new and exciting Microgaming slot game.